Function: Downloads and converts YouTube videos. Requirements: Mac with 1 GHz Intel processor, Mac OS X 10.5. Trial: Feature-limited (limitation on conversion duration). Enolsoft specializes in a variety of multimedia conversion software. Among the company’s video tools for Mac is an application that removes virtually all complexity from saving a YouTube video to a computer and converting it to many popular formats. 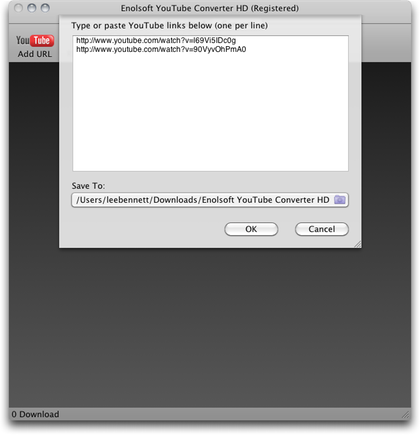 YouTube Converter HD will batch download any number of videos in one step. After all desired URLs are pasted in, and the download destination is selected, it’s just one click to begin downloading all the videos. For some people, just downloading YouTube’s .FLV Flash files is the goal. If so, the job is now done. There are many Web sites such as KeepVid that will do the job for free. Even Enolsoft has a free product, YouTube Downloader HD, which batch downloads .FLV files the same way as YouTube Converter HD. However, the difference with YouTube Converter HD, as its name conveys, is the ability to convert those .FLV files into a choice of many popular formats, including audio-only files. Downloaded videos immediately show up in the Convert section, ready for conversion to one of many popular video or audio formats. In addition to downloaded YouTube URLs automatically appearing in the Convert section, I can instead click Add Files to convert .FLV videos already saved to my computer. One of several user interface improvements I’d like to see is the ability to drag files to the window as an alternative to clicking Add Files and using the standard dialog box to navigate and find desired files. YouTube Converter HD allows me to individually specify the conversion format for each file, or keep the “Apply to all” checkbox enabled to quickly set the format for all files. I was somewhat disappointed that most of the settings in the screenshot above weren’t editable, in spite of the combo box interface that suggested they were. But it turns out that various fields can be edited depending on which conversion format is selected. In the case of 720p Apple TV-friendly MP4 files, the video and audio bitrates are the only adjustable setting. However, when I chose a basic QuickTime .MOV as the conversion format, even though H.264 and AAC remained the only available video and audio codecs, I could adjust all other settings. The number of conversion formats was pleasantly surprising. In addition to the expected Apple-preferred formats for iTunes, iPods, iPhones, iPads, and Apple TVs, YouTube Converter HD can also convert to Windows Media, RealPlayer, MPEG, etc. It can even create videos compatible with non-Apple devices including PlayStation, Zune, Xbox, Galaxy Tab, Xoom, most any device that supports 3GP or MP4, and more. Although the ability to choose from dozens of conversion formats is most welcome, the user interface to choose them is somewhat less welcome. Once the conversion format selection interface is opened, its navigation is handled almost entirely by mouseover events, which makes getting around a little awkward. It’s hard to explain without showing it, so here’s a short video demonstration. As shown in this video, once I clicked the “Convet to:” [sic] menu, at no time during the rest of this video did I click the mouse until I was ready to select a format. The mouseover-style navigation can be a little tricky. Notice a few things in this video. The categories on the left side are activated as soon as the mouse hovers them. This means I have to be careful to move the mouse directly to the right to browse through the formats in that category. Around 22 seconds in the video, it’s apparent that I had some trouble staying on the iPad category. Then note throughout the video how I only hover the mouse over what looks like a “down” button underneath the list of formats. It looks like something I should click, but the list begins scrolling just from hovering over it. I can’t scroll any slower or faster this way. Thankfully, I can instead scroll with the wheel on my mouse. Also of interest is the cropped appearance of the faux button for scrolling back up. Lastly, something about the creation of this sheet window is such that the Android Video category doesn’t always want to register. This phenomenon can be seen at the end of my video. Once the desired conversion settings are made, a single click of the Convert button is the last step. Be prepared to wait, especially if an HD format is used. In spite of the Intel CPU requirement, my observation is that YouTube Converter HD is not multi-CPU aware. I tested the application on an 8-core Mac Pro and never saw more than a single core peg at its maximum at any time during the conversion. My menu bar CPU monitor only pegged various individual cores during conversion. Activity Monitor only reported an average of 115% CPU load. A multi-CPU aware application should generate a much higher load. By comparison, I made a conversion on the same .FLV file with MPEG Streamclip, and my CPU monitor looked like this, with an average CPU load of 375%. Enolsoft’s product lineup and pricing is an intriguing topic. The first thing to consider is the feature of downloading YouTube .FLV files. This function really isn’t part of YouTube Converter HD’s $29 price, considering Enolsoft has a separate, free application for the task. 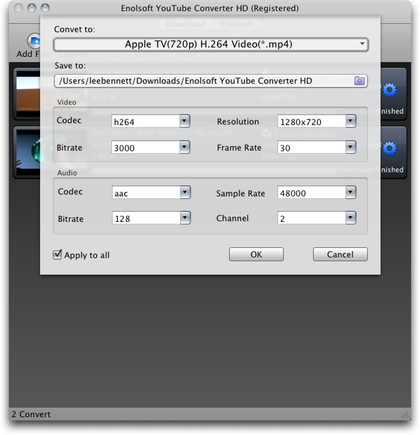 What one pays for in YouTube Converter HD is the conversion capabilities. However, this application is only able to use .FLV videos as the source format. It will not convert from any other format. Also in Enolsoft’s product lineup are two separate utilities for converting most any format to iPad- or iPhone-friendly formats. That’s right, a single $29 utility for iPad formats, and another for iPhone formats. They’re like the reverse of the YouTube Converter HD software. Instead of going from just one format to any format, the iPad or iPhone converters accept most anything as the input format, and the only output formats available are those compatible with the respective devices. The least expensive product on the list (not counting the free YouTube downloader), at $25, is YouTube to MP3 Converter. On the opposite end of the price list is the $35 Enolsoft Video Converter. It doesn’t automatically download YouTube videos, but it does convert from any supported format to any other format, and it includes some basic editing and effect functions for video. It shouldn’t be difficult to figure out why I devoted a few paragraphs talking about Enolsoft’s other products. If YouTube Converter HD were the only product Enolsoft made, a $29 price tag seems very reasonable to me. However, I’m not so sure about the logic of charging $25 for downloading YouTube videos (especially considering Enolsoft’s free product for this task) and only being able to convert them to one of seven audio formats, when just $4 extra includes conversion to many different audio and video formats. Similarly, for just $6 above YouTube Converter HD’s price, I can get Enolsoft’s application that accepts many different formats as the input source and get simple editing capability as well. In summary, my assignment of a Good rating on this application comes from two factors: a somewhat quirky interface and odd pricing in comparison to other Enolsoft products. My recommendation: spend the extra $6 and use the full Video Converter along with the free YouTube Downloader HD application. Even better would be for Enolsoft to abandon YouTube Converter HD and incorporate the downloader function into the full Video Converter application. While doing that, price the YouTube to MP3 Converter to an amount more appropriate for its single function, and rename it as YouTube to Audio Converter since MP3 is not the only file format choice available. Otherwise, reduce the prices of YouTube Converter HD and YouTube to MP3 Converter to be a better value in comparison to Video Converter for those who do not need all of Video Converter’s capabilities. Copyright © 2011 Lee Bennett. Reviewing in ATPM is open to anyone. If you’re interested, write to us at reviews@atpm.com.